When Pine first launched on the App Store in January, I was charging $4.99 to download Pine. After several weeks on the App Store I have realized that this business model for Pine will not work. Getting the right business model on the App Store is tricky and you can rarely get it right the first time. According to my App Store Analytics, Pine has been seen by roughly 50% more users in the App Store than Step It Up… However, the amount of downloads does not reflect this difference. This is expected since Step It Up is free and Pine is not, but the difference is far more than expected. After some thought, I have decided to offer Pine as a free download with two breathing exercises available immediately after download for users to try. 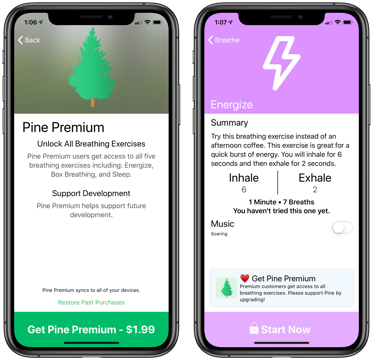 Users can then unlock all five breathing exercises by upgrading to Pine Premium for $1.99 (USD). This decision appears to me as the best choice. Pine Premium will transfer to all of the devices you can use Pine on: iPhone, iPad, Apple TV. If you purchase pine on your iPhone, it will transfer to your iPad automatically and vice versa. If you purchased Pine on the App Store before it was a free download, I would like to thank you for supporting me. Please email me with a copy of your receipt from the App Store and I will provide you with a promo code to unlock Pine Premium.